Tuesday, September 4th, was our first official day for all grade 6-12 students and Center High School/Skoglund Middle School staff members rolled out the red carpet for kids. Thanks to middle school language arts teacher Shirley Atencio, other first day of school events included students being serenaded by a band paid for out of personal donations from staff members. Middle/high counselor Katrina Ruggles coordinated a student assembly to teach everyone about changes in school rules. She also prepared teambuilding exercises for students throughout the day. It can clearly be seen that Center High School and Skoglund Middle School staff members take great pride in making the first day of school fun and exciting for all students. Congratulations to Center Schools science teachers Lisa Renner, Russ Braiden, and Daniel Newmyer for securing a Community Learning Garden grant. This will give us an opportunity to establish a community garden while relating learning activities to our middle and high school students. Appreciation also goes out to Katrina Ruggles and Vista worker Matthew Platt for the effort they put in on this grant application. Finally, Haskin Elementary School has secured funds through the district BEST grant to institute a K-3 one-to-one iPad program. This will allow the district to purchase iPads to be used as classroom response devices and textbook/literacy resources. We are excited to have this opportunity to teach our youngest students using modern technology devices, providing them with appropriate educational gaming opportunities, and sending them home with full libraries of appropriate books! On Tuesday I spent the day in Saguache working with the county on the big Secure Rural Schools funding decision they faced. After hearing much input from the community and referencing many letters they received from concerned citizens, the Commissioners voted 3 to 0 to accept a smaller pool of money, excluding the districts from receiving a guaranteed share of SRS dollars. The basis of the commissioners’ decision was their need to pump funding into the County general fund. After seeking ways to make it possible, the commissioners believed in the end that there was no way SRS funds could be accepted by the County and eventually transferred, in a legal way, to their general fund, where they are most needed. However, immediately after their vote not to receive SRS dollars the commissioners moved to allocate $500,000 of current road and bridge fund reserves to be distributed to the school districts. This action was taken because the commissioners felt ensured that the one thing SRS funding can be spent on other than Road and Bridge projects is schools. In addition to the $500,000 referenced above, the commissioners also voted to pass on to the schools roughly $100,000 through a smaller stream of funds they will also be receiving, making the grand total of dollars being allocated to Saguache County school districts $600,000. We think a decision to accept SRS funding and a 50/50 split between schools and counties would have resulted in approximately $850,000 coming to the schools. We truly appreciate the commissioners taking a close look at their options, keeping the needs of the Saguache County school districts in mind, and even continuing to work toward a more beneficial solution for the County and the school districts since making their decision on Tuesday. On Wednesday my main focus was on our construction. I met in the morning to go over final furniture, fixtures, and equipment needs, and remaining budget resources. In the afternoon we made some decisions that included purchasing bordering road improvements for 4th street and Sylvester, purchasing some additional cabinetry, and putting upstairs and varsity gymnasium vinyl murals in place. On Thursday I had meetings about the high school SPARK PE curriculum and our revised Elementary RTI process. On Friday I was in Denver attending the Colorado Association of School Executives Coordinating Council meeting and a meeting at the Legacy Foundation regarding an upcoming Race to the Top District/Consortium grant opportunity. Our main focus last week was the Secure Rural Schools funding matter. Though a decision was made on Tuesday, we learned over the weekend from Commissioner Linda Joseph that the County has been working directly with the Colorado Department of Local Affairs to see if it is still possible for Saguache to receive a larger allocation of SRS dollars that would benefit the school districts AND the county general fund. Another major area of focus we are working on is the possibility of applying for a federal government Race to the Top District/Consortium grant. In order to be eligible to participate in this grant each district or consortium must serve a minimum of 2,500 kids, of which 75% must qualify for free or reduced lunch. If you put all of the districts together in the San Luis Valley, we fit the basic requirement and would qualify for a grant between 10 and 20 million dollars. The focus of the work that must be proposed under the guidelines of the grant includes adopting common core standards and assessments, measuring college and career readiness of students, implementing data systems that measure student learning, recruiting-developing-rewarding and retaining quality educators, and putting forth efforts to turn around consistently low performing schools. The Colorado Legacy Foundation and the Colorado Department of Education have been noticing the work we have been doing in the SLV through our Race to the top of the Valley collaborative. Because of this CDE and CLF have interviewed us about the vision for our project and our possible interest in applying for the grant. After several meetings, the Legacy Foundation notified us of their interest in supporting our efforts to submit a grant application. On Tuesday at the San Luis Valley Superintendent Advisory Council meeting Valley superintendents will be discussing this possibility and making a decision as to whether or not to go forward with an application. Moving forward with an application would mean a lot of work would have to be done between now and the end of October when the grant is due. 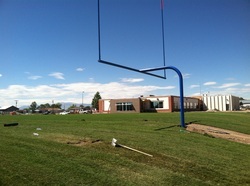 Folks around Center have probably noticed we now have grass on our new football/soccer practice field. Our South parking lot is done being laid, though we will still need to stay off it for another week as the cement cures. Locals might have also noticed that light poles are being erected all over our property as well. On the inside of the building varsity gym flooring is being laid and many finishing touches are beginning to be put in place on the vocational/adult learning facility remodel. On Monday I will be taking a personal day to recover from a triathlon I will be participating in on Sunday. However, I will return to Center in time to meet with Lobato v Colorado lead attorney Kathy Gebhardt. On Tuesday I will begin the day at a Haskin Elementary staff meeting working to communicate our new RTI process to the teachers. I will then attend the San Luis Valley Superintendent’s Advisory Council meeting in Alamosa, a Boettcher Teacher Program meeting afterward, then the Center Schools District Accountability and Board of Education meetings in the evening. This meeting will mark the first time we conduct our work in the new school facility, as we will hold these sessions in the community room attached to the library from now on. On Wednesday we have an administration team meeting that will include hosting administrator visitors from the Las Animas school district with whom we will be working on how to conduct classroom walkthroughs and how to support teachers in writing effective lesson plans aligned to the curriculum. On Thursday I will be participating in classroom walkthroughs with building leaders. On Friday I will be conducting RtttV work. I am hoping that work will be focused on applying for a Race to the Top District/Consortium grant for the whole San Luis Valley. My wife Becky and I have been training the entire year to prepare for a half iron distance triathlon. During the past nine months we have dedicated ourselves to swimming, biking, running, and strength training two times per week. We have done so to prepare our bodies and our minds for a 1.2 mile swim in Aurora reservoir, a 56 mile bike ride over a very hilly course, and a half marathon (13.1 mile) run . . . all on the same day. We are truly proud of the hard work we have done to prepare ourselves. Yet, though we have achieved these distances in the past we find ourselves extremely nervous about how our race day will go. The last time Becky tried this event she experienced 2 flat tires and eventually had to drop out. I finished in 8 hours and 52 minutes but found myself walking the better part of the last 6 miles on the run. Why am I writing about this? As the picture I have attached clearly illustrates, sometimes we just need to get out of our comfort zone to make ourselves better or to achieve "magical" things. Finishing a half iron triathlon may not be a magical thing to some people. It will be to us. Doing so at an age when we thought we may never be able to do one again will make it even better. If you are reading this post on Sunday morning around 8 AM, think about us in 67 degree Aurora Reservoir stroking along with 300 other swimmers. We’ll be swimming for about an hour. If it's between 9 AM and 12:30 PM, we’ll probably still be on our bikes. Between Noon and 4 PM for me, we’ll likely be slugging out our 13 mile run. There will be many times during the event where we'll have the option to just quit. Traditionally around 35 of the competitors have to stop for one reason or another. I hope we don't have to.